I bet my mom loves me being on YouTube because it means she gets her present early. 🙂 I went ahead and did my mother’s day present a week early in case any of you out there needed an idea for a quick and easy DIY present for your own mom. My brother and I built a birdhouse hotel for our mom when we were just little kids (with the help of a family friend of course) and even though it’s hung in there for all these years it was just about falling apart so she asked if I would remake it for her this mother’s day. I was going to try and salvage the roofs at least from the original build but even those were in pretty rough shape, so I am going to show you how to build a bird house from scrap wood AND how to patina copper so it looks aged. If you would like to build one as well then I do have a FREE set of plans for you to download here. I looked around my scrap bin and I had a lot of 1×6 scrap cut offs left over from previous projects. They were a mix of different woods but since I planned on painting my project I didn’t mind. This is a great scrap wood project so I would recommend checking to see what you have before buying material. 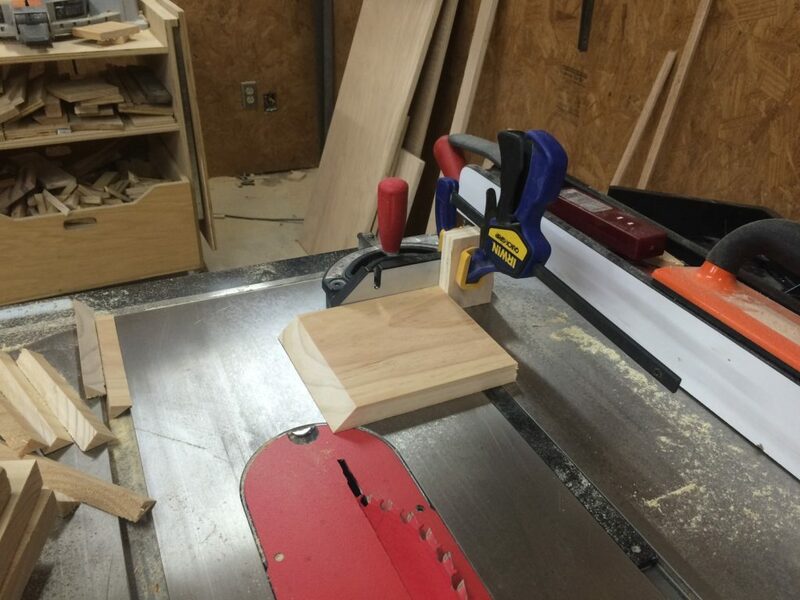 I started by cutting all my boards to length first at the miter saw. Since a lot of these cuts are repetitive I utilized a stop block. I again used a stop block to cut all the 45 degrees on the front and back pieces. 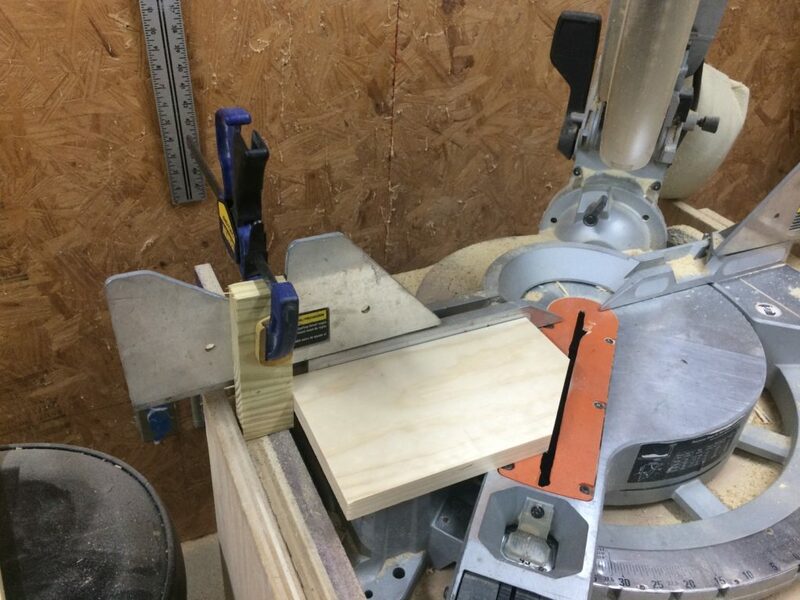 To make the 45 degree cuts on the sides I used my miter gauge at the table saw. After all the boards were cut I took the fronts and used a 2″ forstner bit to make a hole. Of course if you want a larger hole you can either use a bigger bit (maybe a hole saw bit) or you can use a jigsaw and cut out a circle by hand. Since this is going outside I wanted every inch of this to be painted, to give it a little protection, so I painted all the boards before I assembled them together. I put on a total of three coats of paint on both sides. Tip: When I go to the big box store I always look in the Oops paint section and look for white or off white colors to buy cheap (since I paint so many things white). So for this project I already had a quart of white paint that I only spent $2 on months ago. While I was painting I went ahead and cut my post down to size. 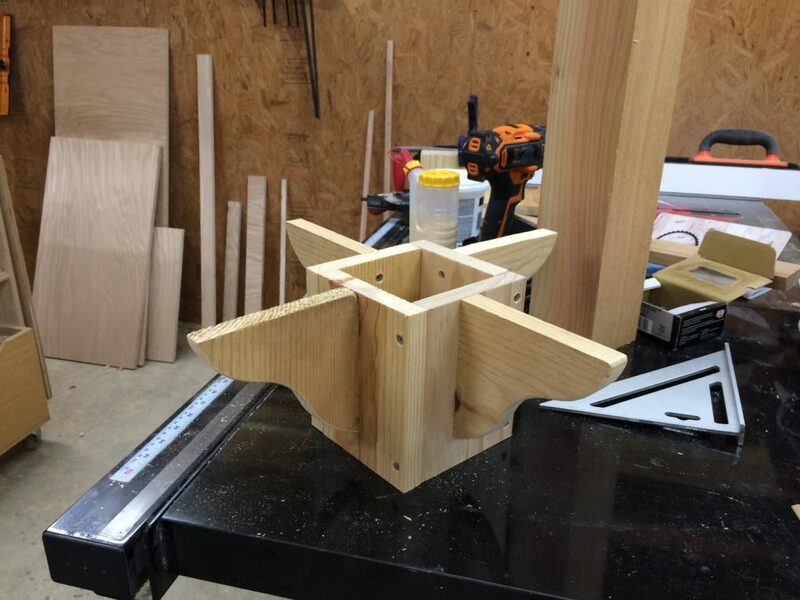 I’m using a 4×4 cedar post and I cut mine to 6′ tall. Cedar is a great wood to use outdoors because it’s naturally rot resistant. I gave it a light sanding then also gave it three coats of paint. When all the boards were dry I started attaching things together. I used a countersink bit to predrill my holes but to also make the screw heads slightly recessed (so that I could later fill in the holes and hide them). Next I cut out a base for the birdhouses to rest on. 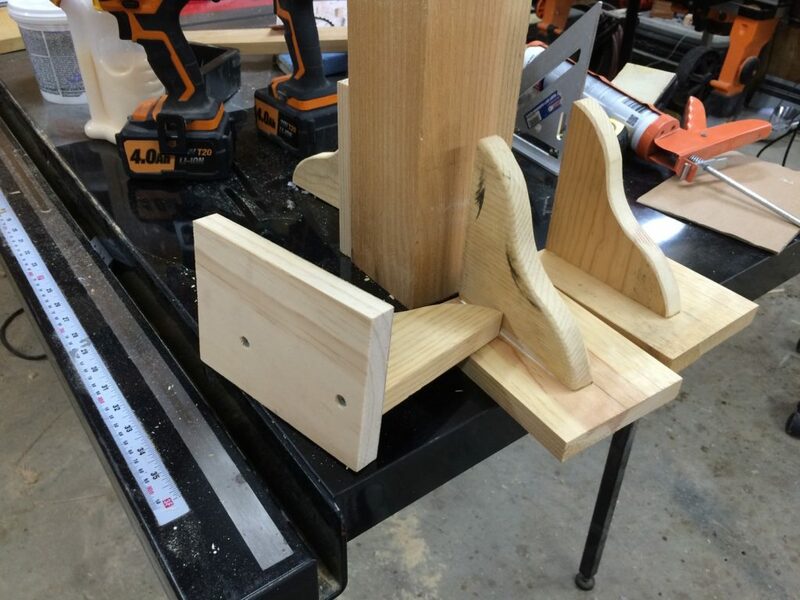 To give it a little more support I also made a few decorative right angle supports. I first cut out the supports using a bandsaw (you could use a jigsaw instead) then used a spindle sander to refine the shape (you could also use a sanding block). I joined the supports to the back plate piece with glue and two screws. Again, using a countersink first to make sure the screw heads were recessed. These supports are not centered! They are slightly off centered so that when all four are joined together, they are centered. : ) If that makes sense…. This acts as a sleeve so that you can slip your birdhouse on a 4×4 post. Note: I left an 1/8″ space on two sides so this sleeve is not a snug fit. Next I added it to the base using the construction adhesive and also a few screws. With everything assembled I went through and filled in all the screw holes with the construction adhesive then let it dry for an hour before giving everything a final coat of paint. I attached the roofs to the birdhouses using the adhesive and a few screws on each side. If you are interested in seeing how I patina the copper I wrote up a tutorial you can check out here! I used the construction adhesive once again to attach all the bird houses to the base. I started with adding the center, tallest birdhouse. Then came back and added the smaller ones. The last thing I did was add a line of caulk to the base of the houses so no water gets in. If you would like to build this exact birdhouse then I have a set of plans available to download for free!